Sudhir is an accomplished CEO, financier, private investor and board member. 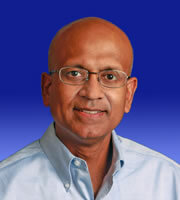 Sudhir has invested in numerous private companies, taken board roles, and overseen and guided management teams through periods of growth and transition, including Exed LLC, Long Agribusiness, Zuca Inc, Earth Mama Angel Baby, Careerwaze and Skyline Construction.Most recently, he has been advising CEO's of growing middle market companies in the Western United States and investing in early stage companies. He has served as CEO of a number of investor owned, middle market companies, including Cruiser Customizing, an ecommerce business; Ancora, a mailing services company, and National Pen Corporation, a manufacturer and marketer of promotional products.During his tenure as Managing Director of Alvarez & Marsal, a nation-wide consulting firm, Sudhir serviced a broad range of clients.Earlier in his career, Sudhir was SVP at Bank of America and a banker at JP Morgan. His education includes an undergraduate degree from Dartmouth and a MBA from Stanford.